13.5% The wine had a creamy, herbal nose and it was rich and smooth, almost sweet with a touch of spritz on the palate. There was some white peach, sweet grapefruit and a herbal finish, but after tasting the others and coming back it suffered in comparison. 13.5% This had a matchstick nose with a round, “fatter” aspect compared to the first. Some caramel on the palate and a more tannic/acidic feel to it, Warmer on the finish. 12.5% Flinty nose and a little smoky, not particularly “Riesling”. Lime on the palate, a touch cordial in aspect, with a dry, short finish, getting drier. 12.5% Perfumed nose, some banana. No faults but this struggled, very short, a little flabby with a warm finish. 13% A comforting nose; warm, oaky, with a touch of spice. With a lean approach it was linear on the palate, but balanced with moderately fine tannins and showing family resemblance to the previous. A good wine, with 3-5 years ahead of it. 13% The St. Laurent had seen 12 months in oak and gave a chocolate and coffee nose, with some smoke. It was well balanced for a light bodied wine; sweet, young fruit with some tannin, developing some pecan and hazelnut flavours, but the finish is a little dry. Very good value, stood up well to the higher priced bottles before it. 13% Some sweet cherry wood with a touch of espresso on the nose. It was soft with light tannins. Area under Vine: Austria produces one percent of the world’s wines. The proportion of red wines has doubled over the last two decades and now represents one third of Austria's vineyards, which total 48,000 hectares, almost all of it in the east of the country. Main grape varieties: White grapes account for two thirds of vineyard plantings and there are 22 varieties recognised for quality wine production, including international types. Gruner Veltliner : Accounts for 30% of the country's vineyards. Indigenous to Central Europe and can produce a wide range of styles from fresh and simple to complex oak or lees -influenced rich fine wines. Some producers are now making sparkling versions. Riesling: despite the abundance of quality wine it only accounts for 5% Austria's vineyards. It came from the Rhine's ancient vineyards to the Danube. It is bone dry, elegant and steely with fresh citrus flavours. Scheurebe: Highly aromatic variety from Germany, mainly grown in Styria. Sauvignon Blanc (produced in Styria) is often quite austere, tight and mineral. Production is small and local demand is high. Not widely exported. There are 13 red varieties classified, accounting for one third of the vineyard area. Zweigelt: A cross developed in the 1920s using St. Laurent and blaufrankisch makes up 15% of plantings and the most widely planted red. Produces light fine reds which have precise sour-cherry and redcurrant flavours, fine tannins and spicy linear finish. Blaufrankisch: Late ripening indigenous grape with dense tannins, high acidity and concentration that can age well. Notes of blackberries, ripe cherries or plums. The grapes need warm summers to fully ripen, but in good years can achieve complexity and depth. St. Laurent: Often confused with Pinot Noir as they have a similar profile: red berry perfume, light, elegant and crisp. St. Laurent is often often used to add elegance to a blend. 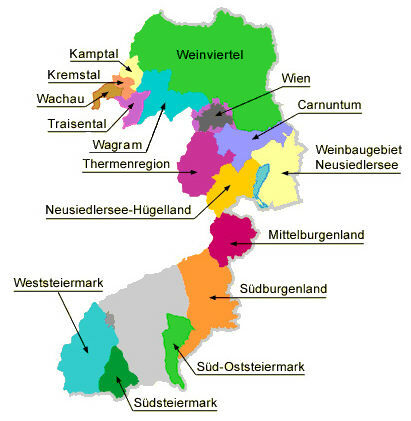 Classification System: Austrian Wine Appellations are classified by DAC - Districtus Austriae Controllatus. Landwein: >14°KMW, >17 g/litre dry extract, <11.5% alcohol, <6 g/l residual sugar. A Tafelwein that comes from just one region. Qualitätswein: >15°KMW (can be chaptalised to 19°KMW for whites, 20°KMW for reds), >9% alcohol. Comes from a single wine district. Extra trocken - bone dry. Halb trocken - half dry. Beerenauslese (BA): >25°KMW, bad grapes removed, very sweet wine. Ausbruch: >27°KMW, botrytised grapes, grape juice or late harvest wine may be added to assist the pressing operation. Traditional sweet wine speciality of Rust usually deeply coloured, with more than a hint of Tokay character. Trockenbeerenauslese (TBA): >30°KMW, completely botrytised grapes, noble rot. Eiswein: >25°KMW, further concentrated by being harvested and pressed when frozen. Strohwein or Schilfwein: >25°KMW, made from grapes dried on straw mats. Steinfeder ("Stone feather"—named after a grass, Stipa pennata, that grows in the vineyards): maximum 11.5% alcohol, mostly for local quaffing. Federspiel (named after a falconry device): 11.5% to 12.5% alcohol and a minimum must weight of 17° KMW, roughly equivalent to Kabinett. Smaragd (named after an 'emerald' lizard that lives in the vineyards): minimum 12.5% alcohol, with a maximum 9 g/litre residual sugar; some of the best dry whites in Austria. Geography/Climate: In the middle of Europe, a classic continental climate of hot summers, cold winters, good diurnal shifts (day to night temperatures) and generally moderate rainfall. The wine regions are confined to the east of the country, where the Alps settle into the great Pannonian Plain, running north to south along the many borders from Czech Republic to Slovenia, which provides warming conditions, suitable for the production of red wines in particular. The significant influencing factors on localised winegrowing conditions are the mountains, the altitude of vineyards, and the rivers (esp. the Danube) and lakes (such as the Neusiedlersee), which influence vineyards planted near them, altering humidity, temperature, and creating conditions for Botrytis. Soils: fertile, loamy soils, whilst glaciers and ancient seas have left areas of complex geology including clay rich in marine fossils and areas of chalk, sandstone, shale and limestone. Many areas are planted on steep slopes, sometimes terraced, allowing each vine full exposure to the sun. Wine History: Austria has a long history of wine making, dating back to Roman times. It was not particularly well regulated and during the later 20th Century was producing a large amount of poor quality wine. This lack of regulation led to the anti - freeze scandal in the mid 1980s when brokers were found to have adulterated cheap sweet wine with diethylene glycol, an ingredient of anti-freeze. This resulted in a severe tightening up of regulations, which are now among the toughest in the world. The country has now got over this scandal and has a reputation for high quality white wines in particular. Key Wine Regions; Although wine is grown in all federal states of Austria, wine-growing plays a major role in only four of them: Niederösterreich (Lower Austria) in the north, Burgenland, Styria (Steiermark) and Vienna. Within these four major winegrowing areas 16 specific DACs have been designated.